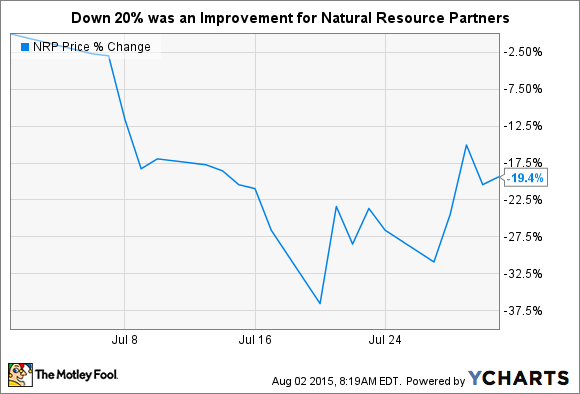 What: Natural Resource Partners' (NYSE:NRP) units fell almost 20% in July. The biggest driver of that was the company's coal exposure (about 40% of projected 2015 revenues), which is actually indirect since it owns and leases out coal mines and doesn't actually mine for coal itself. However, recent diversification efforts into oil and natural gas (around 10% of projected revenues), both of which are also stumbling along at low prices, hasn't helped any. So What: Under normal market conditions leasing coal mines is a great business with impressive margins. However, with major domestic miners hitting the skids and falling into bankruptcy, Natural Resource Partners' big customers are suffering. And the risk of a customer closing down operations at this lessor's mines is material. It's a lot different than selling less coal or dealing with lower coal prices because the closure of a mine could mean the complete loss of revenue from one of Natural Resource Partner's assets. That's a problem because the debt associated with those assets doesn't go away—and Natural Resource Partners may have little say in the decision if a lessee goes bankrupt. Worse for Natural Resource Partners right now is that its efforts to diversify away from coal, while important, haven't been enough to offset the negative effect of the coal downturn. In fact, the recent push into oil and natural gas is facing equally as vexing commodity price headwinds. How bad is it? In late April the partnership slashed its distribution by 75% and refocused around solidifying its balance sheet, a clear nod to the difficulties it's facing. Now What: Natural Resource Partners hasn't reported second quarter earnings yet, but they aren't likely to be pretty. And with the company's customers facing significant headwinds of their own, you'll want to keep a close eye on how the coal side of Natural Resource Partners' business is holding up financially and contractually (in other words, how many mines are being run by miners at risk of going under). But, in the end, until the air clears a little bit, you are probably best sitting on the sidelines here.